1. Preheat the oven to 190˚C, gas mark 5. Cut the beetroot into halves or quarters, depending on size (no piece should be larger than a golf ball). Place in the centre of a large piece of foil, toss with 2 tbsp olive oil and add the balsamic vinegar and rosemary; season. Scrunch the edges of the foil together to make a loose but tightly sealed parcel. Place on a baking tray and bake for 40-60 minutes, until tender. Set aside to cool to room temperature. 2. Remove the rosemary from the beetroot parcel and discard. Tip the beetroot and any juices into a serving bowl. Add the pomegranate seeds and any juice collected when separating them from the pith. Pour in the remaining 2 tbsp oil and the lemon juice. Toss through to mix. 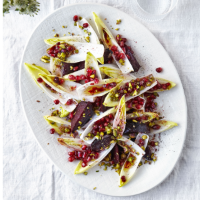 Finish by adding the chicory leaves and pistachios, then toss again. Serve at once while the chicory is still crisp. This recipe was first published in Thu Mar 29 16:52:35 BST 2018.